you are familiar with all my ways (Psalm 139:1-3 NIV). For the believer, life is a growing collection of God stories. You have more than you know. God is there in every new page of the adventure, whether we feel His presence, or not. We trust the promise, "Never will I leave you ..." (Hebrews 13:5). Embedded in each trust experience is a faith story. That means I choose to live life believing that I'm connected to the God of the universe, even when I don't feel like it, or understand it. "You know what Mr Fredericksen? The wilderness isn't quiet what I expected." "It's kinda wild...I mean, it's not how they made it sound in my books." "Um, get used to that kid." "That might sound boring, but I think the boring stuff, is the stuff I remember the most." Adventure happens in the unexpected and scary times, in the grieving times, in the risky times, and sometimes in the boring stuff. After we've lived awhile, God helps us understand. He opens our eyes. He validates our trust. He reveals new truth, new stuff. And, we have a story to tell. Our life is filled with His fingerprints and times when He shows up. He weaves together these faith events and grants us moments of understanding, epiphanies of meaning and direction and wisdom. He encourages our spirit of adventure. God has known all along what we are only now discovering: that without these stories, we get lost. 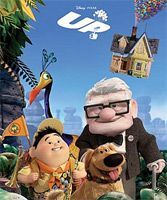 The movie, Up, is primarily about the spirit of adventure living inside Carl and Ellie. The first 10 minutes of the film is great storytelling, even in the 4-minutes of silence. Hint: You don't have to have words to tell a story. Carl dreams of adventure, but he is very comfortable keeping the adventure inside his fantasy world. After all, he's just a kid. Then he meets Ellie, a sassy little would-be adventurer who lives every moment with an infectious spirit. From that moment on, they are inseparable. They marry and make the old club house their home. They share joys and tragedies, ups and downs, dreams and disappointments, and the "cross-your-heart vow." Someday, they will go to South America, to Paradise Falls. It's in her "Adventure Book." But, something always keeps them planted in their little house. Carl and Ellie grow old and never visit South American jungles. And, then, Ellie dies leaving Carl with the house filled with beautiful memories of the way it used to be. He thought the adventure was buried with Ellie, then young Russell interrupted Carl's boring life ... adventure takes a deep breath and a new chapter begins ... headed UP. Start this year with a journal that collects your faith stories. Look back on your pictures and search for God's fingerprints. Write down what God reveals. There is more hidden in the past than you remember. Listen for your story in silence ... even in the boring stuff. Close your mouth. Open your eyes. Silence is the prerequisite to imagination. We must be present and observant to the world around us, the world within us, and the movements of God in both. See beyond your vision. Got a Problem with God? Find the Plot to Your Dots! "God in the boring Stuff?" by Ron Rose is licensed under a Creative Commons License. Heartlight encourages you to share this material with others in church bulletins, personal emails, and other non-commercial uses. Please see our Usage Guidelines for more information.